The mess from last blog entry has been mostly cleared, and Dublin has been good to me so far. Too bad that none of that made it into my blog! This has to change. Let's try my luck with a simple picture project for now: Virtual polaroids! 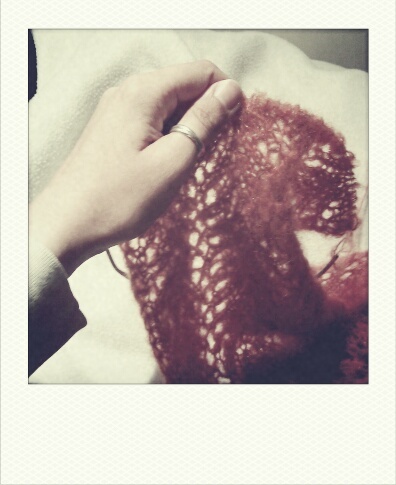 Pictured above is tonight's knitting. The scarf has been on my needles for a long time and travelled with me quite a bit. Amusingly, now I even met its designer and saw the original when buying wool at thisisknit.ie (lovely yarn shop, especially after seeing only acrylic and cotton yarn in Poland. Their site has the pattern for free!). It's pretty long already. If I keep watching Lost, I might even finish it. The weather has been changing wildly from 12°C and rain back to 23° and sun, so I think woolly things will be useful throughout the year here.